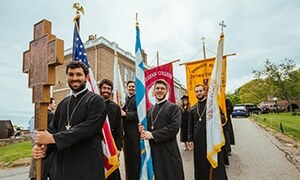 In earning a Master of Theological Studies, students gain proficiency in Orthodox theology and history. The two-year MTS degree educates students through the study of such disciplines as Church history, dogmatics, ethics, scripture, patristics, and canon law. Students must also demonstrate competence in New Testament Greek, as they learn to think theologically and critically about the Orthodox Christian tradition in today’s world. The MTS program is designed to offer a general introduction to Greek Orthodox theology through graduate level study. It is a first degree in theology and differs from the Master of Theology (ThM) in that the latter typically requires three years of previous graduate theological education prior to admission. Students may choose to specialize in an area of academic interest by enrolling in elective courses at both Holy Cross and the schools of the Boston Theological Institute. In addition to four semesters of full-time academic study, students are afforded the opportunity to participate in the integral religious life of the Holy Cross community in the context of daily worship and personal spiritual guidance. The MTS program does not provide the educational nor pastoral requirements necessary for priestly ordination. Those seeking ordination in the Orthodox Church are directed to the Master of Divinity program. In addition to regular admission requirements, MTS applicants must hold a bachelor’s degree or its equivalent from an accredited college or university. No prior preparation in theology or religious studies is necessary. However, prospective students who do not have a bachelor’s degree in the humanities are encouraged to have read broadly in the areas of Orthodox theology, religion, and philosophy.